Deep water soloing, or DWS, gained a lot of popularity (or at least media attention) in the south-west of England around the end of the '90s (although it most likely has been done all over the place for many years before). It literally involves soloing routes above deep water, meaning that falls can be not only safe, but fun! As you might expect, the actual level of safety varies with tide, rocks and so on. 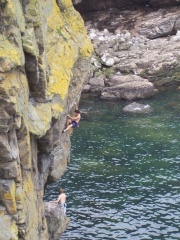 Deep water solos don't take place too much in Scotland, probably due to the water temperature! This page was last modified on 17 August 2012, at 16:58. This page has been accessed 23,757 times.